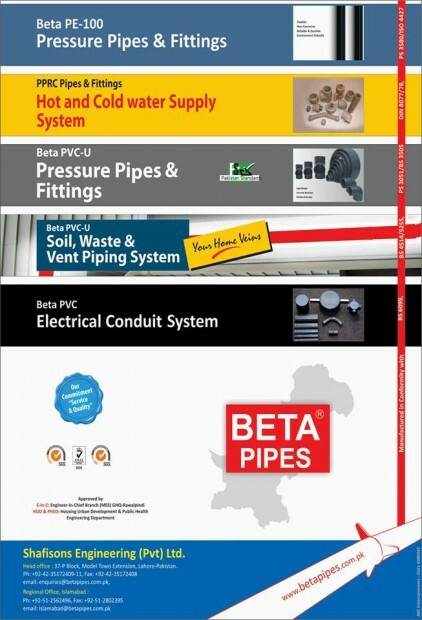 Shafisons Engineering (Private) Limited (SSEPL) created ripples in the field of Engineering Plastics in year 1994 by launching of brand, “BETA PIPES”. Our business activities are focused on the development, manufacturing and distribution of plastic pipe systems and solutions. At Shafisons Engineering (Private) Limited, we aim to be the most valuable solution provider of plastic pipe systems, unrivalled in terms of quality, reliability, affordability, availability, technical innovation and customer satisfaction”. Our entire management is committed to the motto of “Service and Quality” where customer driven approach is demonstrated by providing excellent products and services which are result of constant improvement and innovation at the highest quality level. We feel proud to revolutionise the pipe industry in Pakistan by introducing plastic materials replacing traditional metallic and concrete systems. At SSEPL, we manufacture multiple pipe systems for various applications mainly utilising three different materials, Polyvinyl Chloride (PVC), Polypropylene Random Copolymer (PPRC) and High Density Polyethylene (PE-100). Our product range covers PVC-U and PE-100 Pressure pipes for potable water applications, PVC-U Electrical conduit system, PVC-U Soil, Waste and Vent (SWV) pipes and fittings, PPRC pipes and fittings for above-ground hot and cold water supply applications. Our ‘Customer Care’ department offers a variety of services including technical support, design proposals and estimates, customized tools and techniques which are to be followed up by regular feedback in order to enhance the customer satisfaction and user experience. Our most important asset is our professional work-force, which has played a pivotal role in turning dreams into realities by sheer hard work, team-working and constant focus on delivering services internally and externally to harness core competences, brand loyalty and customer satisfaction.